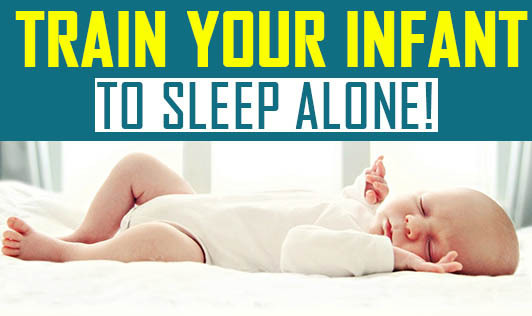 Train Your Infant To sleep Alone! For almost all parents, putting a baby to sleep and all alone can prove to be a challenge. Good sleep habits are as critical as good hygiene to a child's cognitive development and well-being. So try to introduce your baby to the idea of going to sleep alone and on schedule. 1. Observe your baby's sleeping, waking and eating patterns for a few days. Pair with his/her natural rhythms to make the sleep routine easier. 2. Try to set a regular night time routine and wake your baby up at the same time every morning. A bedtime that occurs at the same time every night will set your baby's internal clock so that he/she is naturally sleepy at a predictable time. 3. Keep the bedroom cozy and noise free. Make the bed ready with the blankets warm and aerated. If the slightest noise stimulates him/her, play some soothing music to cancel out the noise. If your child loves natural sounds, you could try them to put the baby to sleep. 4. Keep to specific nap times during the day. Three nap times are usually enough. 5. Turn off the lights. Leave the night light as is or with glowing toys to comfort the baby. The darker the room, the better it is for the brain to start releasing the sleep hormone melatonin. 6. Place your baby in the crib before he falls asleep. Placing the baby in the bed when sleepy, but not actually asleep, allows your baby to learn to fall asleep on it's own. 7. Do not be alarmed if your baby cries. Return to the baby's room a few minutes after you have left. Talk, read, sing and soothe your baby, but do not pick him/ her up. 8. A middle-of-the-night feed will still be required, but it can be changed after several weeks of introducing solid foods and discouraging the night waking feedings. You can move your child's feeding to earlier in the bedtime routine or slowly reduce the number of ounces or number of minutes of this feeding. 9. If you are anxious about your baby's sleep, you can sneak into the room to observe him/her every 10 minutes without the light and noise. If your baby is up, quietly lift and comfort him/her for a few minutes, then gently place your infant back down to sleep. 10. Stick to it. Do your best to stay with whatever strategies you choose until you start to see the results. It may be difficult to hear your child cry so much, but try to see it through for at least a week before trying another strategy. These approaches might need to be repeated for several nights until the infant learns to sleep all alone.Be patient! If you are a working parent, try to spend as much time as possible with him/ her before they go to bed. It will develop a sense of bonding.